City Council President Kevin Kelley announced last week that he would not authorize an attempted transfer of more than $700,000 from a discretionary pot of Ward 7 funds. Outgoing Ward 7 councilman TJ Dow had attempted, days before he left office, to transfer those funds to Ward 4's Ken Johnson, a man who routinely wears track suits to council meetings. Dow claimed in a letter that the money would go toward a "capital project" at the Ken Johnson Recreation Center, presumably the pool. Ward 7 and Ward 4 are both on the city's east side, but they do not touch. Dow's Ward 7 includes portions of downtown, St. Clair-Superior and Hough. Johnson's Ward 4 is further south. It includes portions of Buckeye-Shaker and Woodland Hills and is loosely bordered by Buckeye Road to the North and Union Avenue to the South. After the transfer request was discovered, but before it was either approved or denied, Mansfield Frazier, (another Ward 7 council challenger) called Dow's attempted maneuver a "dirty trick." "Dow obviously is still pissed off at Basheer Jones for running against and besting him fair and square at the ballot box, but this desperate attempt was the height of pettiness and folly," Frazier posted to Facebook. 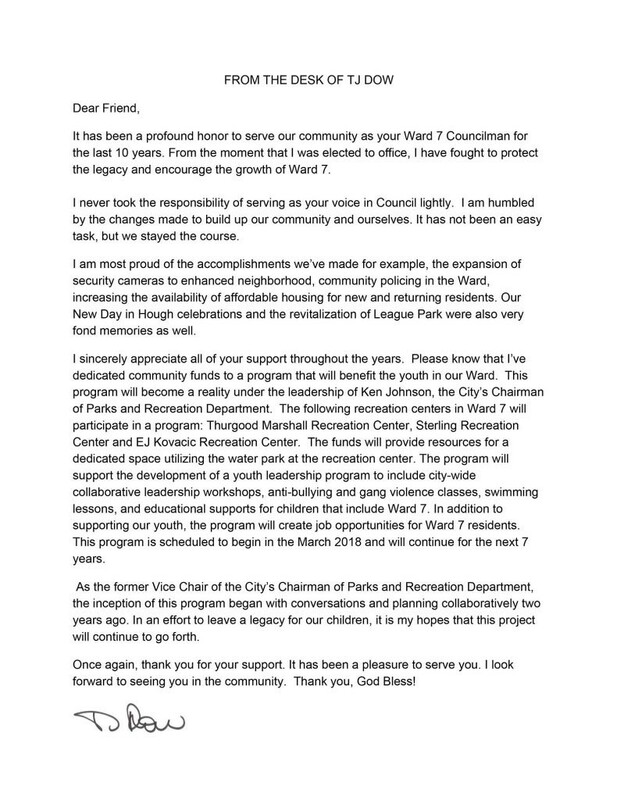 "How can anyone with even a modicum of integrity try to financially hurt the residents of the ward he has professed to love for so long?" The implication was that Dow was ridding the ward's coffers to screw over Jones, who would use that money to fund organizations of his choosing and generally support economic development initiatives or other capital projects. Dow, reportedly, had been stockpiling reserves in the hopes of building a community resources center, a project that never got off the ground. When Scene reached Jones for comment last week, the newly sworn-in councilman said that his opinion on Dow's attempted fund transfer was unnecessary to state. "I think what he did is clear," Jones said. "You're not talking about me. You're talking about the ward, about disrespecting the babies and the teenagers and the elders and the organizations. You're talking about all of those. This is not about me. This is about the residents of Ward 7." But in a letter posted to social media over the weekend, TJ Dow rejoined with "[his] sides of the story." Though Kelley had already said he would not authorize the transfer by that point, Dow explained that the funds would go toward an ill-defined program to be hosted at the Ken Johnson Rec Center pool. "This program will become a reality under the leadership of Ken Johnson, the City's Chairman of Parks and Recreations Department [sic]," Dow wrote. "The funds will provide resources for a dedicated space utilizing the water park at the recreation center. The program will support the development of a youth leadership program to include city-wide collaborative leadership workshops, anti-bullying and gang violence classes, swimming lessons, and educational supports for children that include Ward 7. In addition to supporting our youth, the program will create job opportunities for Ward 7 residents. The program is scheduled to begin in March 2018 and will continue for the next 7 years." What on earth is Dow talking about? A program to support the development of another nonexistent program? Poolside gang violence classes? Seven years! It all sounds like it was composed with predictive text, (or, more likely, like it was cooked up on the spot). How does this alleged program square, for example, with the initial allocation request, which asked that the funds go toward the "Ken Johnson Recreation Center Capital Project"? And why must this one alleged program, with (at best) peripheral benefits for select Ward 7 youth, consume all of the available Ward 7 discretionary funds? Kevin Kelley didn't need long to deny the request, for he could sniff the answers as well as anybody. He certainly didn't need to read the full ridiculous letter (included below), which purported to have been sent "from the desk of TJ Dow." Thankfully, said desk is no longer housed at Cleveland City Hall.